Photo: Huddersfield Examiner. Growing Newsome Potato Day at Newsome Scout Hall. Left to right: Jacqui Sullivan, Cherry Holding, Jan Siddall and Monica Plested. If you missed out on our recent Potato Day, we still have some varieties of seed potato available for you to buy. They’re for sale at £2 per dozen, mix and match (or 20p each). Available for collection from Newsome or from Huddersfield town centre. We may also be able to deliver locally. Smooth skinned, delicious when cooked or steamed. Successful for local growers. Heavy crops with pure white tasty flesh. Very good disease resistance. Deep red in colour and a vigorous grower. Great flavour. Good for baking, boiling, mashing and chipping. Dry, floury texture. High yields of general purpose potatoes. White oval tubers. New waxy potato variety. Small, set-skinned tubers. Boil, steam, crush or roast. 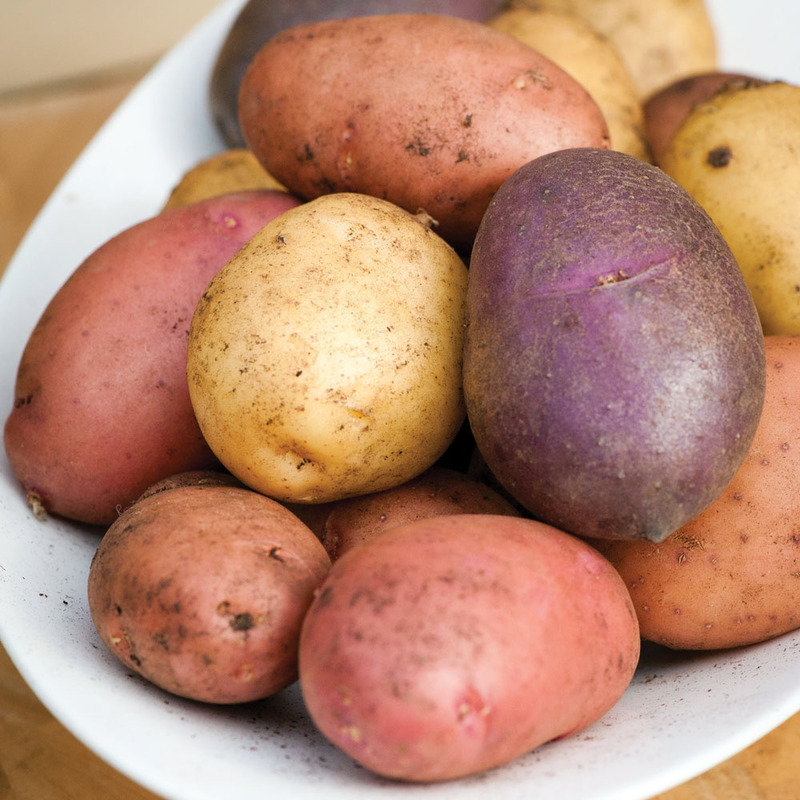 Waxy textured and well-flavoured potatoes that do not disintegrate when cooked. Small, firm, waxy potatoes. Good for salads or boiling. Grows long if given space. Attractive, white-skinned tubers with a splash of red. White creamy flesh. High yielding. Boils well with no discolouration, makes excellent bakers and roasties. Also good for chips and crisping. A classic maincrop variety, sold early in the season by Jersey growers under the trademark “Jersey Royals”. Russet skin. One of the best for baking, frying and roasting, with a rich flavour that improves on storage. We highly recommend Pink Fir Apples – they’re our biggest seller. You can cook them whole and there’s no need for peeling. We also have some Sturon onion sets and some Jerusalem Artichoke tubers. Let us know if you’d like some.